After the World’s Top Goalscorer of 2007, the IFFHS (International Federation of Football History & Statistics) has done the impossible: make yet another controversial ranking, and make some more thousand-something fans pissed off about it. This time, it’s the All-Time Club Rankings. An All-time Club World Ranking can only be meaningful and useful if it can be determined by taking account all the results of the national championships, the national cup competitions, the club competitions of the six continental confederations and the FIFA. It is therefore only possible to determine an All-time Club World Ranking from January 1st, 1991 – when the Club World Ranking began taking all these details into consideration. The period from 1872 to 1990 can only be asssessed subjectively, mostly by using national and international champions as a guide. It follows that teams placed in the individual competitions cannot be taken into consideration, even if their titles were won easily or in spite of many defeats. It is simply not possible to establish a basis for giving all participating clubs an equal opportunity for the period 1872 to 1990. The IFFHS has therefore has decided, logically, that the All-time Club World Ranking should be determined from January 1st, 1991 using the annual Club World Ranking (the situation at 31st December annually). For this it will take into consideration the “Top 50 Clubs”, annually and award them points from 50 points for the top club down to 1 point for the club in 50th place. Adding the points from the individual years for each club will provide the All-time Club World Ranking. The result? The “lucky winner” of the IFFHS All-Time Club Ranking is FC Barcelona with 670 points, who in the period from 1991 to 2007 won 8 La Liga titles, 2 Copa del Rey, 6 Supercopa de España, 2 Champions League, 1 Cup Winners’ Cup, and 2 European Super Cups. Completing the top trio, we find Juventus (7 [minus 2] Serie A titles, 1 Coppa Italia, 4 Supercoppa Italiana, 1 Champions League, 1 UEFA Cup, 1 Intertoto Cup, 1 European Super Cup, 1 Intercontinental Cup) and Manchester Utd (9 EPL titles, 4 FA Cups, 2 League Cups, 6 Charity Shields, 1 Champions League, 1 Cup Winners’ Cup, 1 European Super Cup, 1 Intercontinental Cup). One of the funny things about this year’s All-Time Ranking is that compared to 2006, AC Milan has actually dropped by 2 ranks to 5th spot (behind Real Madrid). Yeah, the same AC Milan which won the UEFA Champions League in May, the European SuperCup in September and the FIFA Club World Cup at the end of the year. Man Utd and Real Madrid did win their respective national titles, but still weird I find. Completing the Top 10 right behind AC Milan, we find Bayern Munich (6th), Inter Milan (7th), River Plate (8th), Arsenal (9th), and Porto (10th). Further down the list, Italian club Parma is incredibly ranked 12th, right behind Ajax Amsterdam and their huge cup gallery, but in front of clubs like Chelsea and Liverpool (13th and 14th). Huh? How did that happen? By now most of you are probably screaming for murder, so in defense of the IFFHS ranking, let me just mention that it does accurately reflect the top world leagues of the past two decades, at least in terms of total number of clubs present. In the 191 ranked clubs, the Spanish Liga and Italian Serie A are the biggest providers, totalling 17 teams each. They are followed by the English Premier League (15), the Campeonato Brasileiro (15), the German Bundesliga (12), and the French Ligue 1 (12). Argentina totals 11 clubs and caps the ‘Big 7′ according to this ranking. Much further down the list are the Belgian, Czech and Dutch leagues (6). By the way, 6 other Italian teams make the IFFHS ranking: Torino (57th), Sampdoria (70th), Fiorentina (80th), Bologna (97th), Genoa (105th) and Vicenza (185th). In the end, despite IFFHS’s explanation for their selection criteria (see above), such a ranking is a fairly poor representation of an “All-Time” statistic. 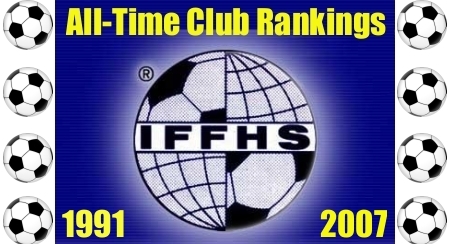 By only counting club history from 1991 onwards, IFFHS should effectively have forfeited the right to use “All-time” in their ranking terminology. Nevertheless what you are looking at here, should more or less accurately reflect the teams who have dominated the world of football from 1991 to 2007. That at least, we can admit. For comparison, the UEFA ranking (last updated to May 25, 2007 i.e. before the Rossoneri European SuperCup and Club World Cup triumphs) puts AC Milan at nº1, followed by Barcelona, Liverpool, and Inter. 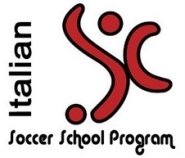 Quoting Gazzetta dello Sport, the IFFHS “would be a much more respected institute if it took into consideration the entire world of football. That is, starting from the time someone in England had the great idea of inventing the sport. It was the year 1872″. This entry was posted on Saturday, January 5th, 2008 at 2:07 pm	and is filed under English Premiership, Fiorentina, Genoa, German Bundesliga, Spanish Liga. You can follow any responses to this entry through the RSS 2.0 feed. Both comments and pings are currently closed. i feel the team that should feel most robbed because of the 1991 time limit should be liverpool…..if the 80s were considered,it would have been an entirely different story for them……. Rangers, 19th!?!?! and worse Spurs at 85th.. Faarrk Off!! Amen to that, Liverpool_Fan. But I don’t make the rules at the IFFHS. I wouldn’t call it an all-time ranking. But yes, Barcelona is the best. Undoubtedly. They’ve won a lot. They’ve seen through two of their best periods(the Dream Team and the Ronaldinho era) and are heading towards a Maradona repeat now. Barca deserve the top rank…..
why start at 1991? why not from the last 10 years to make it easier. liverpool fans this is what the rest of the world has been telling you for the last few years yes you won the champions league a few years ago (well done) but the rest is history now. come back into the top 10 teams in the world when you win the Premiership. By these criteria it is only logical that AC Milan dropped 2 places, because they have had a horrendrous season last year (apart from a marvelous road in the CL, they were horrible everywhere else). It is also the only logical explanation for Man Utd to be third in these rankings. (Barca 21 trophies, Juventus 16-2, Man Utd 26). So, as opposed to the UEFA rankings, which stil have AC Milan as the best club in the world despite them having had a disatrous year and a half, these make some sense. River Plate #8 and Boca Juniors #17 ? Are you sure ? WTF ! I do not much care for the rankings since such rankings rarely reflect the actual scenario. Oh, maybe this is off the track….. Any time such club rankings are made, I notice that Manchester United are always somewhere near the top. For Christ’s sake, why don’t these people realise that Man United are not even the best ever club in England! Statistically, Liverpool are the best club in English history. That’s considerably more impressive than anything Barca, Man United or Juve managed. Milan should be ranked #1 and Real Madrid #2. Between them they’ve played in more European Cup finals since 1991 than Barca, Juve and Man United have in their entire history! IFFHS clearly don’t allocate enough points to that competition.